You are here: Home › Other JFK Assassination Texts › George de Mohrenschildt: I Am a Patsy! Lee and Marina Oswald emigrated from the USSR to the USA in 1962. They settled in the Dallas area and were befriended by George de Mohrenschildt, a petroleum geologist, and his wife, Jeanne. The de Mohrenschildts helped the Oswalds and introduced them to their circle of Russian–speaking friends. One member of this circle, Ruth Paine, took over the care of the Oswalds when the de Mohrenschildts went to live in Haiti a few months before President Kennedy’s assassination. George de Mohrenschildt’s memoirs, I Am a Patsy! , were written several years later. They were made public by the House Select Committee on Assassinations in 1978, a year after de Mohrenschildt’s apparent suicide. It is difficult to know how much of I Am a Patsy! is fact, and how much is fiction. One episode, in which Oswald tells de Mohrenschildt that he has threatened to blow up the FBI office in Dallas, is clearly invented. De Mohrenschildt’s description of Ruth Paine is contradicted by, among others, Marina Oswald. De Mohrenschildt consistently portrays Oswald as an anti–racist, although there is good evidence that in New Orleans, Oswald associated closely with a notorious racist. De Mohrenschildt mentions, and denies, the widespread allegations that he himself was a CIA agent. Yes, Lee could be justifiably angry. But he hated FBI most of all. “I did that and promised to blow their god–damn office,” he said angrily. As we know now, the existence of this letter was carefully concealed by FBI from the Warren Commission. Oswald, or someone claiming to be him, did deliver a note to the FBI office in Dallas, in which he deplored the FBI’s supposed harassment of his wife, although the details of any threat are unclear. The note had been destroyed, on the orders of FBI headquarters, immediately after Oswald’s murder. The Warren Commission had been made aware of the note’s existence, but showed no interest in pursuing the matter. The FBI failed to mention either the note or its destruction, and the episode only became public knowledge through a story in the Dallas Times Herald on 31 August 1975. Unfortunately for de Mohrenschildt’s credibility, the note was written in early November 1963, just two or three weeks before the assassination, and several months after the de Mohrenschildts had moved back to Haiti and had lost contact with the Oswalds. 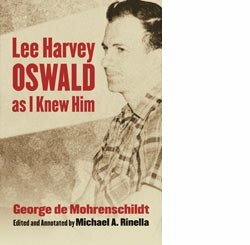 For an overview of Oswald’s relations with the Dallas FBI office, see Gerald D. McKnight, Breach of Trust: How the Warren Commission Failed the Nation and Why , University Press of Kansas, 2005, pp.249–281. In Chapter 16, de Mohrenschildt claims that he was present at the Oswalds’ apartment in West Neely Street a few days after the well–publicised attempted shooting of a retired general, Edwin Walker. The de Mohrenschildts notice a military rifle, presumably the one later discovered on the sixth floor of the Texas School Book Depository. George de Mohrenschildt remarks jokingly that Oswald had used the rifle to shoot at General Walker. Ruth Paine has done more for Marina and June than any other person, yet, for some reason Marina refused to see her after Lee’s death. It is possible that Marina was advised by the authorities to shy away from her former independent–minded friends and she must have been scared stiff of authorities. Time will tell. But still many years went by and she still does not see Mrs. Ruth Paine. Do you still see Ruth Paine? No, I like her and appreciate what she did. I was advised by Secret Service not to be connected with her, seems like she was … not connected … she was sympathizing with the CIA. She wrote letters over there and they told me for my own reputation, to stay away. The Secret Service told you this? They didn’t say anything personal about her, but they said it’s better for me to stay away from her for a while, it seemed like she was sympathizing with CIA. Couldn’t they say she was connected with the Central Intelligence Agency, because that’s our conclusion about Ruth Paine. I don’t know if she was connected with CIA, but they told me to stay away. … Seems like she had friends over there and it would be bad for me if people find out connection between me and Ruth and CIA. In other words, you were left with the distinct impression that she was in some way connected with the CIA? The Soviet Embassy in Washington handed over to the Warren Commission a typewritten letter ostensibly written by Oswald shortly before the assassination. The letter mentioned Oswald’s apparent encounter in Mexico City with “Comrade Kostin”, who was assumed to be Valeriy Kostikov, a presumed member of the KGB’s assassinations department. The Soviets treated the letter as a hoax, an attempt to link their regime to the assassination. Ruth Paine claimed that the letter was authentic: she had seen Oswald typing it, and she had seen a rough draft in Oswald’s handwriting. For the inconsistencies in Paine’s story, and for evidence that the typed version preceded the handwritten version, see Jerry Rose, ‘Gifts from Russia: Yeltsin and Mitrokhin,’ The Fourth Decade , vol.7 no.1 (November 1999), pp.3–8. Ruth and Michael Paine’s house and garage were searched on the day of the assassination by the Dallas police, who photographed and made an inventory of Lee Oswald’s possessions, among them a miniature Minox camera and several rolls of film. Oswald’s ownership of a Minox camera would of course add to the evidence that he was employed as an undercover agent for one or more federal agencies. The FBI at first acknowledged receipt of the camera but later denied that it had existed. When rumours emerged that the FBI’s inventory was corrupt, Ruth Paine produced from the garage a Minox camera, which was claimed to be owned by Michael Paine, and which the Dallas police had somehow overlooked. For a full account of the episode, see Carol Hewett, ‘The Paines’ Participation in the Minox Camera Charade,’ Probe , vol.4 no.1 (November–December 1963). She helped to bring to light a handwritten note which was taken to provide support for the charge that Lee Oswald had attempted to shoot General Walker. Steve Jones, ‘New Evidence Regarding Ruth and Michael Paine’, Kennedy Assassination Chronicles , vol.4 no.4 (Winter 1998), pp.18, 20. James Douglass, JFK and the Unspeakable: Why He Died and Why It Matters , Orbis Books, 2008, pp.168–173. In his book, de Mohrenschildt is at pains to emphasise his liberal beliefs. In real life, all his associations were with those at the opposite end of the political spectrum. He was a member of the Texas Crusade for Freedom, and worked for an oil company owned by the father of William F. Buckley, Jr., the authoritarian propagandist and CIA employee. Buckley senior was if anything even more right–wing than his son. The HSCA also showed that de Mohrenschildt’s first trip to Haiti involved several meetings with individuals associated with the world of intelligence, including Dorothe Matlack, the Assistant Director of the Office of Intelligence of the Army, and Tony Czaikowski, of the CIA ( ibid. , pp.56f). De Mohrenschildt testified before the Warren Commission that in 1938 he had worked with Pierre Fraiss, a French intelligence agent operating in the US, collecting information on people suspected of “pro–German activity” ( ibid. , pp.55f). 24: Who Are the Real Criminals? The complete text of George de Mohrenschildt’s I Am a Patsy! is available online for the first time in valid HTML. The main heading of each chapter is taken from de Mohrenschildt’s typescript. Headings within each chapter have been added for ease of comprehension. English was not George de Mohrenschildt’s first language. Obvious mistakes in spelling and punctuation have been corrected. There are a few instances in which the correct meaning is unclear; in these cases, the original text is preserved and noted. A facsimile of George de Mohrenschildt’s original typescript was published in House Select Commission on Assassinations Report , appendix vol.12, pp.69–315. A scan of the typescript in PNG format is available at http://www.maryferrell.org/mffweb/archive/viewer/showDoc.do?absPageId=40273. Dr Michael Rinella has edited George de Mohrenschildt’s text and added an introduction, more than 700 endnotes, and several photographs.